Next week Epic Games will be releasing a few pieces of Gears of War 2 content. Included in with a package of multiplayer maps called Dark Corners, Road to Ruin is a brand new single player chapter that was cut from the original game. What makes the content unique is the fact that there's two different ways to play through it. 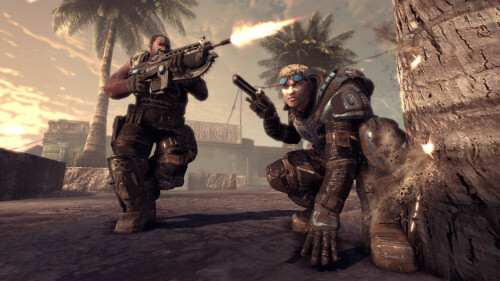 "It's a 90-minute section that was actually snipped out of Gears of War 2, where Marcus and Dom are actually going to the Locust homeworld and they're basically suited up in Locust armor and have a choice - they can go in guns-blazing as they always do, Rambo-style, or they can go with a more stealth approach," the game's producer, Cliff Bleszinski, told Major Nelson's podcast. You'll actually get achievements for playing the content both ways, so there's more incentive to go through it twice. 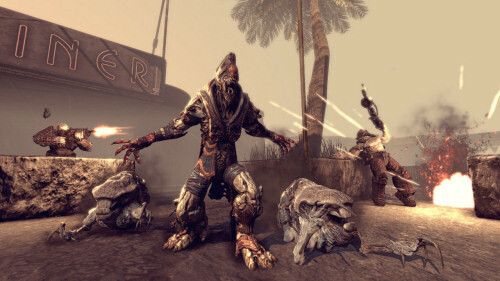 It's the first time console owners are getting their taste of cut content from the Gears franchise, even though PC owners got to play a special level in Gears of War 1 that was cut from the console version of the game. Many were surprised to never see that offered as DLC. So while it all sounds well and good, perhaps the newest DLC isn't as memorable as the Brumak level from Gears of War 1 on the PC. Joystiq played through the content and they came away less than impressed. There isn't much else to Road to Ruin. There are no interesting or original fights, the areas you run through look like the other Locust parts of the game, and the stealth stuff (which is the lone novelty) falls flat. The mission follows the generic pattern of engaging a group of enemies, clearing the room, climbing a ladder, pulling a lever, rinse and repeat. If you're looking for a wonderful and new campaign experience, understand this road to ruin is a deleted scene for a reason. Ouch. Sounds like we'll need to wait till Gears of War 3 for our next great Gears co-op experience.